Whenever I’m in Chicago I try to take a stroll through the Lurie Garden in downtown. I realize that the whole point of Piet Oudolf‘s iconic design is that looks great all the time, just in a different way (and in a way that sometimes redefines what looking great means for a garden), but it never fails to amaze me how different the garden is every time I go. On a quick walkthrough the week before last, the garden looked amazingly lush giving the mid-July date. The salvia “river” the garden is famous for had long gone over, but the rattlesnake master (Eryngium yuccifolium) was taking center stage along with a host of backup players. 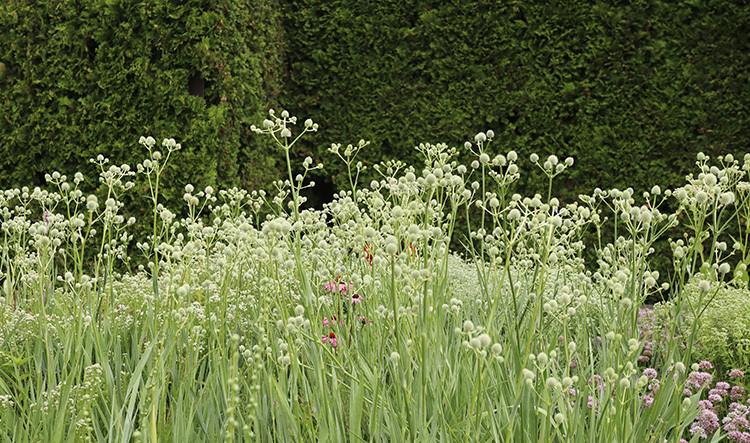 Rattlesnake master (Eryngium yuccifolium) stands against a backdrop of a dark green hedge. 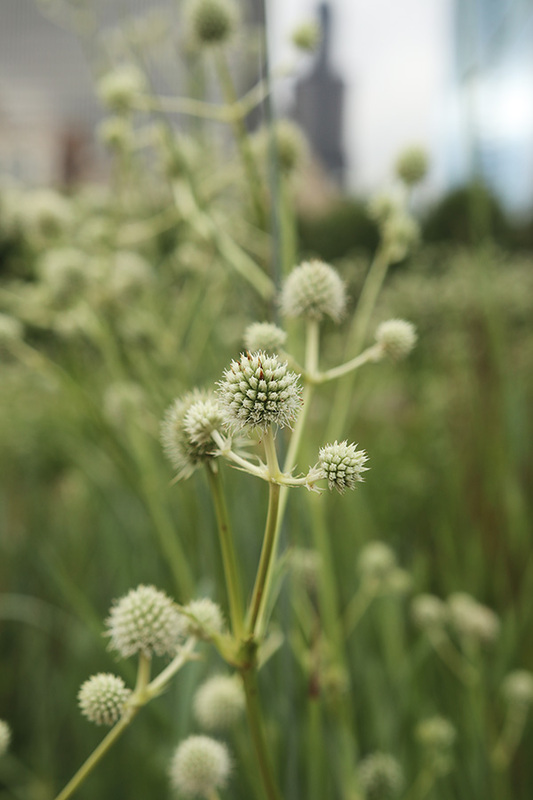 A closeup of rattlesnake master. 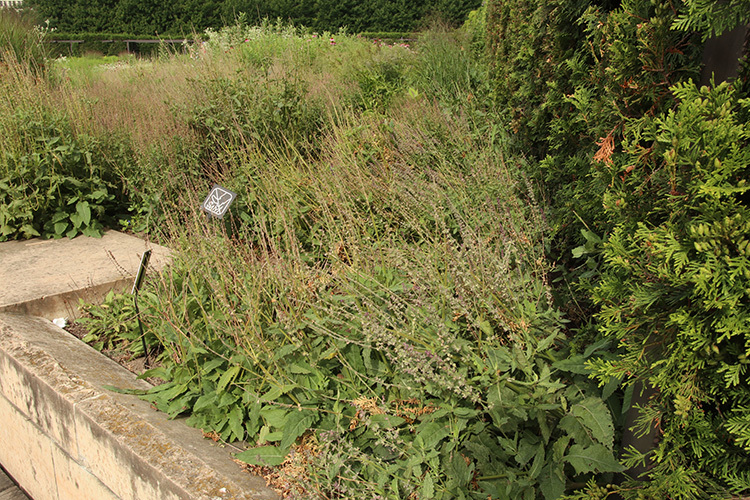 If you aren’t familiar with the concept of the Lurie Garden (and most of Piet Oudolf’s designs), seeing the spent flowers of Salvia ‘May Night’ in the garden might be a bit off-putting. But these plants, along with the entire garden, will be cut back in one fell swoop in late winter. Coneflowers, too, were making their annual debut. I used to think the droopy petals of Echinacea pallida were a little depressing. Now I love the shuttlecock look of this coneflower and recently added several to my garden. 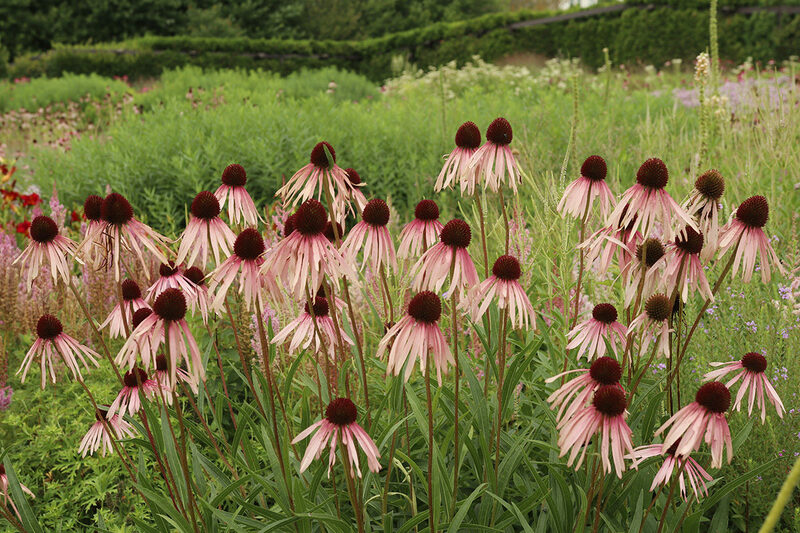 Echinacea pallida in its prime. I love the juxtaposition of the natural garden against the city’s buildings. 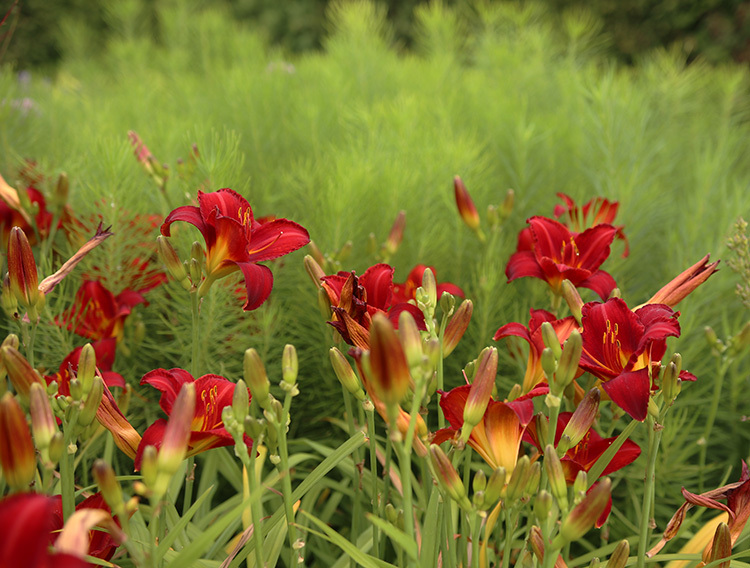 Bright red daylilies stand out against Amsonia hubrictii. 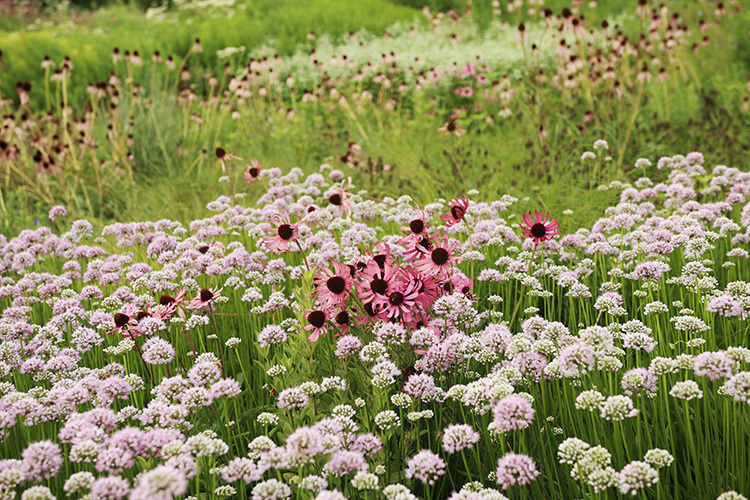 The entire garden weaves together in an undulating tapestry. 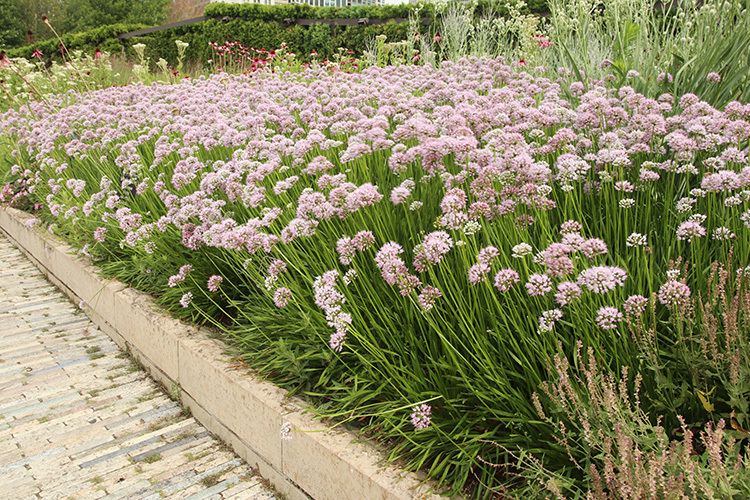 ‘Summer Beauty’ alliums are also making their presence known. 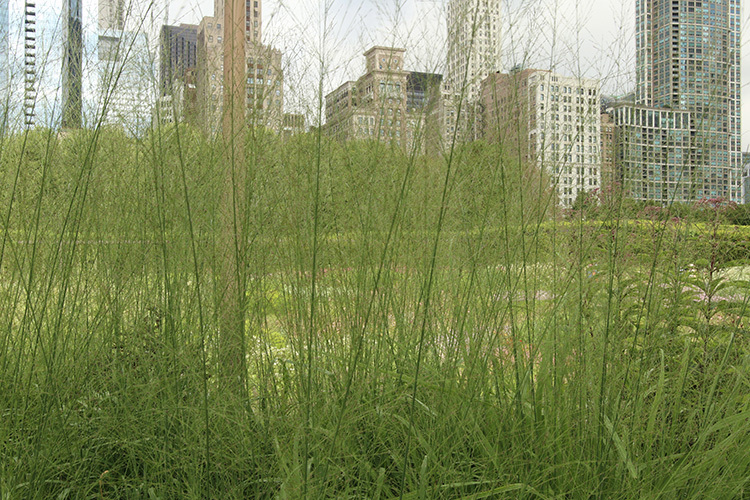 I always leave the Lurie Garden with an idea of something I’d like to add to my own garden and this time it was transpapent moor grass (Molinia littorals ‘Transparent’). I love plants that have movement, but the the see-through nature adds another dimension to the garden. This isn’t the first time I’ve seen mountain mint (Pycnanthemum pilosum), but every time I see it I make a mental note to find a place in my garden where it can be free to spread out a little. 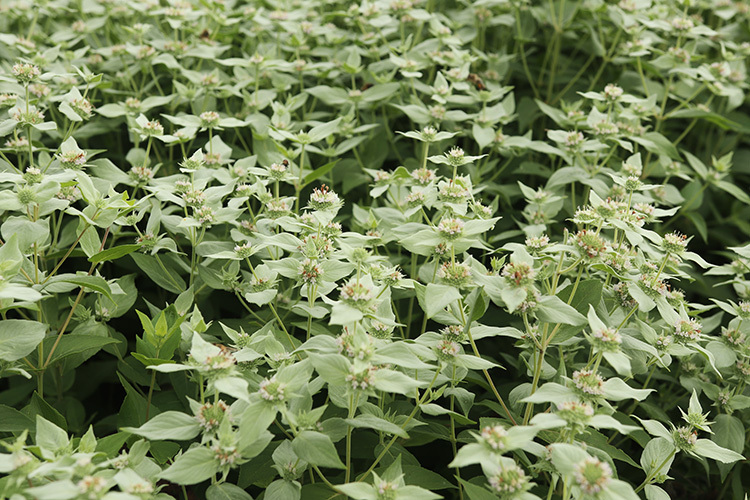 Mountain mint has lovely gray-green foliage that looks, to my eye, even better than the small white flowers it also produces. 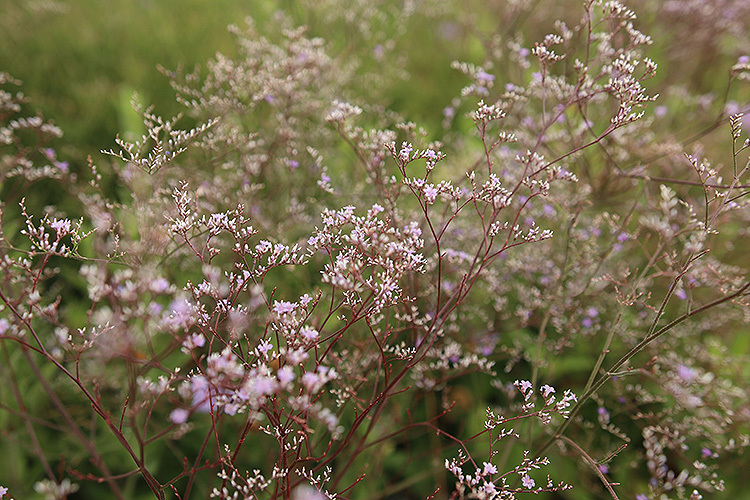 I also fell in love with this feathery plant with the dark red stems: sea lavender. It’s going on my short list as well. 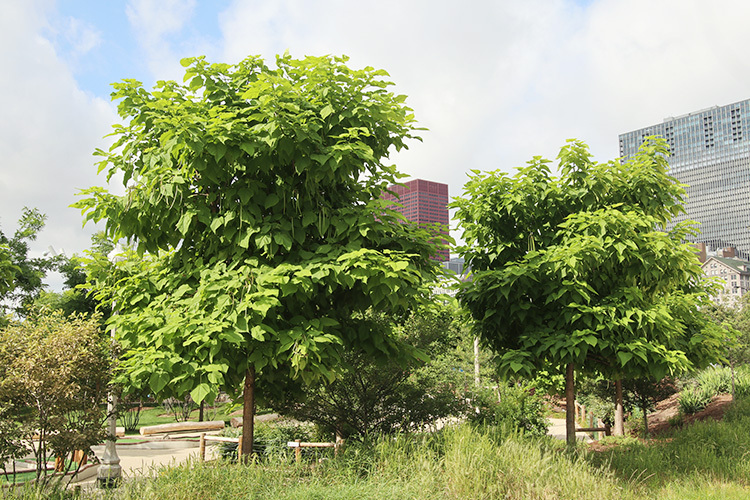 The Lurie Garden is adjacent to Chicago’s Millennium Park, which is a delight all on its own and I admired these Catalpa trees on my way across the wavy metal bridge that leads to the garden. 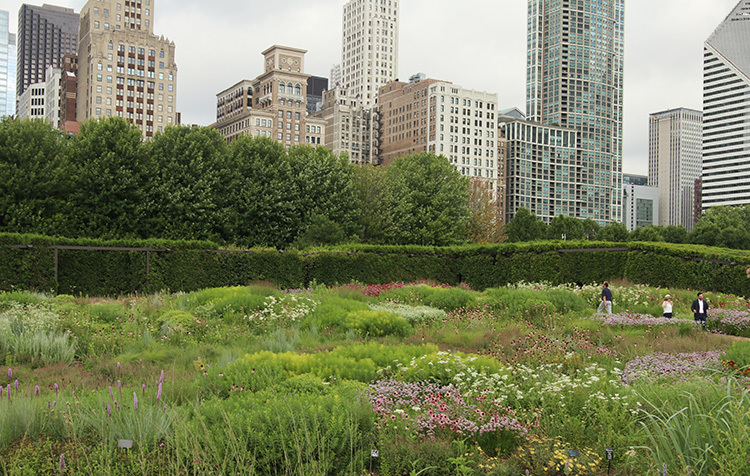 The Lurie Garden has wide paths made of the most wonderful now-aged wood, which manages to reflect the buildings surrounding it and still complement the plants. 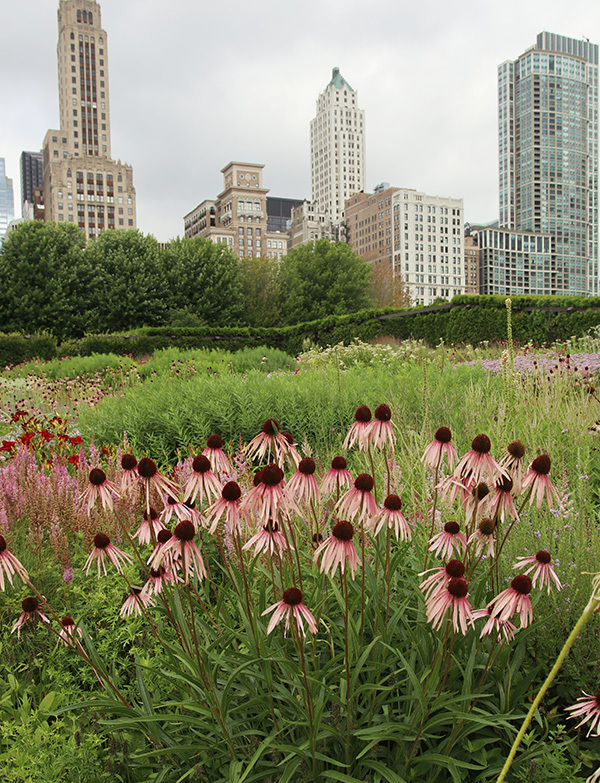 If you find yourself in Chicago, don’t miss the Lurie Garden. It is little treasure in the midst of a bustling metropolis and I guarantee you will take a little something away that will inspire you in your own garden. Gorgeous photos of a stunning garden. We’re so lucky to live close enough to see it a number of times. Pallida has become my favorite Coneflower. One of the best things about that garden is to suddenly look up and see the urban landscape. You entirely forget its there. And what a brilliant forward thinking decision for Chicago to use this land for public benefit. Of course, it has paid off spectacularly in dollars as well. But who takes this kind of urban risk? The High Line is not really in the same category to me. You are so right, Linda! Chicago truly stepped up back when this was in the planning stage. It is an absolute gem. Mountain mint is the best pollinator friendly plant I have in my wildlife garden. I can go out there this month and find at a minimum 25 different kinds of insects from the tiniest bees to a variety of butterflies,including Monarchs,Tiger Swallowtails and beautiful Buckeyes, wasps, bumblebees and honeybees . It is a spreader but I don’t mind and it is really is very attractive among the red beebalm and yellow goldenrod. 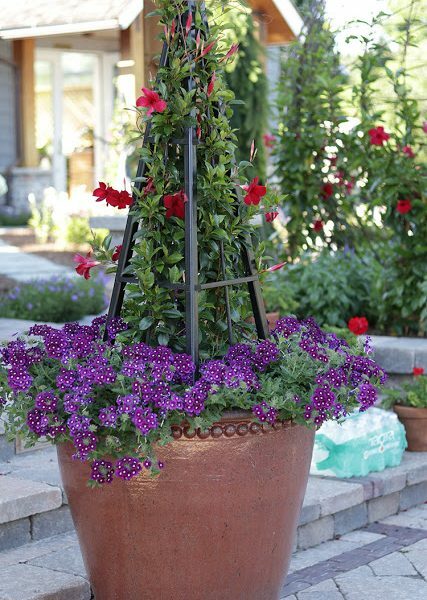 Drought and heat tolerant and It can also be dried for lovely scented flowers for fall arrangements. Can’t say enough good about this plant! Thanks for confirming what I had read about mountain mint. It is coming to my garden next year (or maybe even this year) come hell or high water! I have seen the Lurie a couple of times. It is nice to see it through other peoples lens and to hear what they think of it. You are right about it having something for everyone. I would like to see it a few more times at different times of the year. I need to get there in winter to experience it. I’ve seen it in early spring and high summer and it always impresses me. The phrase “undulating tapestry” is a perfect description of what has been created on the roof of a parking garage. I visit several times a year and make a point of going in the fall to watch the bumble bees work their way into the bottle gentian flowers. That’s just one of the plants that have made their way into my garden after seeing them at the Lurie. The garden is a great resource. 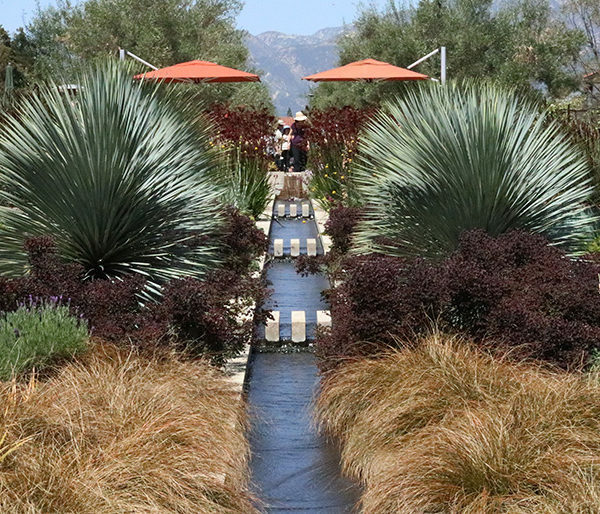 Their web page identifies the plants, their programs are interesting and mostly free and there are docents in the garden Thursdays, Fridays and Sundays during the summer. Great point, Jan. The Lurie website is outstanding. What a remarkable resource! 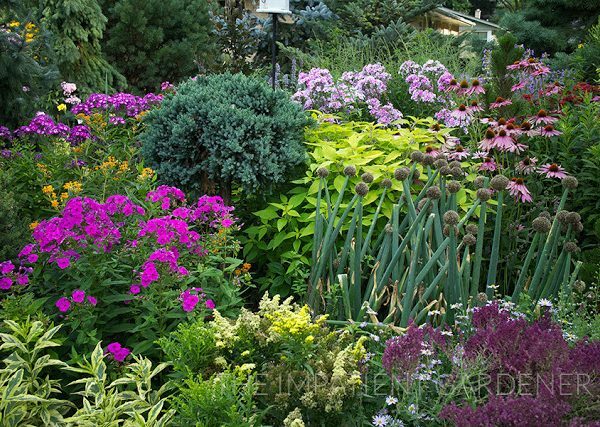 The work of Piet Oudolf and Thomas Rainier are the main inspiration for my garden, though mine is more of a “woodland edge” than the “meadow”-style garden shown here. My challenge in making everything look good is now through the end of August. I am on a shared well and we don’t have a ton of extra water for irrigation, so I can’t easily maintain that same green appearance I see in Oudolf’s gardens. It’s a personal challenge to figure out what can look good in each phase of the garden cycle without a lot of supplemental water and being hit so hard by our drought months that it can’t bounce back for the next year. This is where natives come in really handy. The Douglas Aster is just coming into blooming and freshening things up – that is one TOUGH plant. This year, I am hoping rudbeckia goldsturm and a couple of different coneflowers will be able to take hold and become a lasting part of the garden. Your garden sounds amazing, Kyle. I’d love to see it! 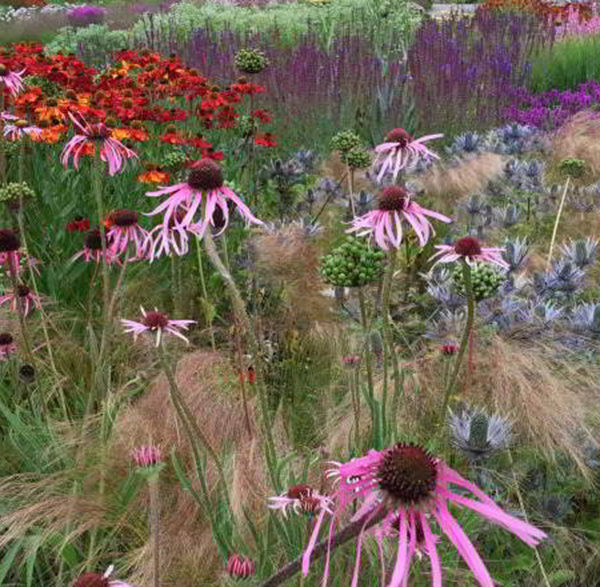 I went to see the Piet Oudolf movie just last Friday…so wonderful! If you have a chance and it is showing near any of you, try and go. 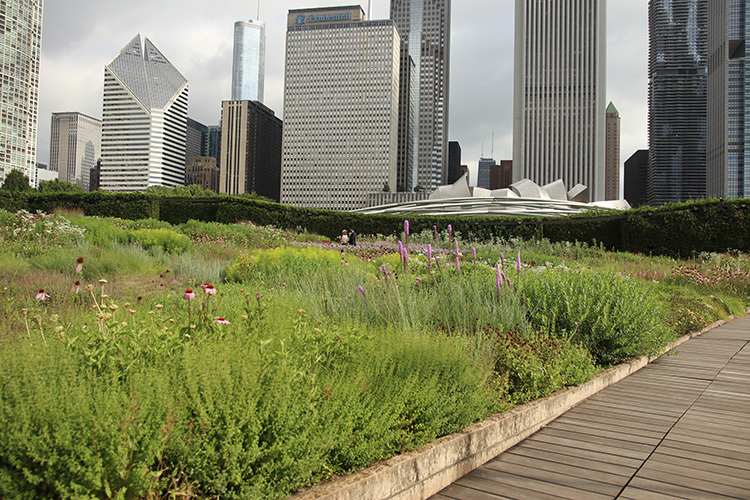 Would love to see the Lurie Garden in person now!! I second that! It’s well worth seeing.